Long before the rumors of a live-action Planet Hulk movie and the partial Planet Hulk story in Thor: Ragnarok, Planet Hulk was a direct-to-video Marvel animation film. The movie tells the story of a permanently transformed Bruce Banner as the Hulk. Because of the danger the Hulk possesses, the Avengers decided to send him off to a peaceful planet. As you can guess, something goes wrong. The Hulk wakes up mid-flight and goes into a berserker rage. He destroys crucial navigational instruments and the ship flies off-course. Crashing landing on the alien planet of Sakaar, he is greeted by aggressors. The Hulk (Rick D. Wasserman) is imprisoned along with other aliens. Their captors force the captives to fight for their freedoms. Only then do the people realize who the Hulk is. He is the savior of their world. Marvel animated movies have been hit or miss. With many more misses than hits. Planet Hulk was more hit than miss in my opinion. The movie tells a concise story. You learn what happened, why, and how the story ends. I believe viewers will enjoy the movie. Not only that, you will walk away with plenty of leadership lessons from Planet Hulk. Let’s dig into the latest Reel Leadership movie and see what leadership lessons lie ahead. Planet Hulk opens with the Hulk being sent into outer space. He awakens to find a video from Tony Stark/Iron Man (Marc Worden) relaying a message. The Avengers decided the Hulk was too dangerous. He couldn’t stay on Earth. They had to send him to a distant, peaceful planet. They were torn on the decision. On one hand, Bruce Banner was a friend. On the other hand, the Hulk was extremely dangerous. They had to make a decision. Their decision was painful. You will have to make many difficult, painful decisions throughout your time as a leader. People will be hurt. Friendships will be destroyed. And tears will be shed. Yet, to lead well, you will have to make choices no one else desires to. You will have to make the decisions that are painful. We must stand together if we are to survive today. Lavin was the bodyguard and love of Elloe Kaifi (Advah Soudack). He was also one of the prisoners forced to fight on planet Sakaar. However, he wasn’t willing to die peacefully. He would put up a fight. He also knew he couldn’t survive alone. His call went out to other prisoners. He encouraged them to fight back. To stand together. Together, they would be better. Are you a lone ranger leader or do you find yourself surrounding yourself with others? If you’re the former, you need to head Lavin’s advice. Leaders go further together. They know they must surround themselves with smarter, stronger, better people. During one of the fights, Lavin was fatally stabbed. His death caused Korg (Kevin Michael Richardson) a reason to fight. Hopefully, you don’t have to die to give your people a reason to do great work. You can inspire your team to do great work while still alive. Give them a reason to work hard. Show them the impact their work will have on the lives of those who will use your product. Korg, The Hulk, Hiroim (Liam O’Brien), Miek (Sam Vincent), Elloe, and other slaves were forced to fight in an arena battle. Their opponents were Korg’s brothers. During the battle, Korg tried to reason with his brother Margus. Margus wouldn’t listen. Korg couldn’t reason with him. Try as you might, there are people you won’t be able to reason with. They’ll have their own agenda. Or maybe they’re under the influence of someone else. Whatever the reason, you can’t get through to them. You will have to figure out what to do with these people. Do you keep them around or do you let them go? The choice is up to you. But know you will have to make a decision. The decision will have an impact on your organization. Yet it’ll be one you have to make. Finally! Now I know who to smash. When the Hulk discovered who was in charge, he knew who his target was. That person was the Red King (Mark Hildreth). The Red King had subjugated his people. He’d forced them to fight. He’d taken away the Hulk’s choice. Knowing who to attack made the Hulk focused. He could now direct his energy in the right direction. You need to discover the direction your organization needs to move in. This will give you clear direction and help you make decisions that will propel you in the direction you need to go. Clearly lay out your mission. Figure out where and what to go after. Then go after it. Hiroim, Korg, Miek, and Elloe took part in a war binding ceremony. In this ceremony, each participant shared the truths of who they are. This united the ragtag bunch. They became a cohesive fighting unit because of their sharing. You can help your team to bond. Whether this is through team building exercises or common experiences, bonding brings people together. Look for ways your team can become closer. Help facilitate these experiences. The Kronan people attacked a planet. On this planet, Thor was stationed. The Kronan’s attacked him. As much as Thor fought against the Kronan, he was being defeated. This is when his friend Beta Ray Bill (Paul Dobson) stepped up to help. Beta Ray Bill joined forces with Thor. He helped him survive the Kronan attack and defeat the invaders. You can’t do this leadership thing alone. You have to have people who have your back. Seek out these people. You need help. There are people willing to help you. Elloe’s people had planned a jailbreak to set her free. They believed the could help her escape. When they appeared at the prison doors, she joined them. She left her friends and tried to escape. The Hulk warned her the Red King had set up a trap. He was betting on the escape and wanted to destroy all hope. Elloe chose to leave the Hulk and her friends. The escape went as the Hulk had predicted. Elloe was captured and her people were killed. Sometimes, you’ll have multiple choices in front of you. You’ll be tempted to chose the easy path. The path of least resistance. Be wary of the easy path. There may be more trouble ahead than you anticipate. The Red King pitted the Hulk against a formidable opponent. That opponent was Beta Ray Bill! In an epic comic book duel, Beta Ray Bill and the Hulk trade blows. Eventually, the Hulk goes into a rage and beats Beta Ray Bill to a pulp. At this point, the Hulk had a choice. He could kill Beta Ray Bill or he could let him live. The Hulk chose life. You will have to make choices at every turn as a leader. There’s never a day where a choice isn’t made. Sometimes it’ll feel like you don’t have but one choice. The truth is, there are always multiple choices. You can choose to do the right thing or the wrong thing. At the beginning of Planet Hulk, Miek was a timid, cowardly creature. By the end of Planet Hulk, he had changed. Seeing Miek change was a cool experience. You could see him slowly change over the course of the movie until he finally reveals his new self. There are people under your authority who you believe won’t amount to much or could never change. Be careful in judging these people. They have potential you cannot see right now. Allow them the time to bloom. Better yet, help them to bloom. Give them opportunities to stretch and test their skills. Show them they’re better than they believe they are. Help them to become the person they were meant to be. The Spikes, creatures that took over and transformed people, returned to the planet of Sakaar. They began to attach to the people. And a genocide began to happen. The Red King’s lieutenant Caiera (Lisa Ann Beley) tried to talk the Hulk into helping her battle the spikes. The Hulk chose not to. Instead, he chose to fight her. She was his enemy. The invading spikes were not his fight. Knowing what you need to fight is a key to leading well. Choosing what to chase after will greatly impact your ability to effectively lead. Make sure you’re fighting the right battle. Don’t chase flash in the pan ideas. While the Hulk originally said he wasn’t going to fight the Spikes, he changed his mind. He later chose to change his fight. You may believe you cannot change your fight, your mission. You need to weight the pros and the cons though. If what you’re doing isn’t working, be brave enough to admit it. Then change it. Caiera had been a loyal follower of the Red King. That was until she discovered he wasn’t the leader she’d believed he was. In fact, the Red King was behind her family’s massacre. He was a BAD LEADER! This gave Caiera the power to break free from his control. She turned on him and helped the Hulk defeat him. The Red King wanted the Hulk dead. Caiera reported to the Red King she had killed him. But he wasn’t dead. He was faking. Be careful of whether or not you’re leading well. If you’re being deceitful or leading in an unhealthy way, people will discover this. And they may turn on you. Do your best to lead with integrity. Be honest and open. Be kind and truthful. Being this kind of leader will help prevent people from turning on you. It’s not me you have to fear. It’s your legacy. Upon learning the truth of what the Red King had actually done, Caiera knew she could use his legacy against him. That’s exactly what she did. She unleashed one of the Spike creatures on the Red King. This prompted his creation (his legacy) of a Death Head to kill him. You have to be aware of the legacy you’re leaving. You’re either leaving one you can be proud of or one you will be ashamed to admit to. Lead with integrity and honesty and you won’t have to fear your legacy. Question: Have you seen Planet Hulk? If you have, what leadership lessons did you take away? 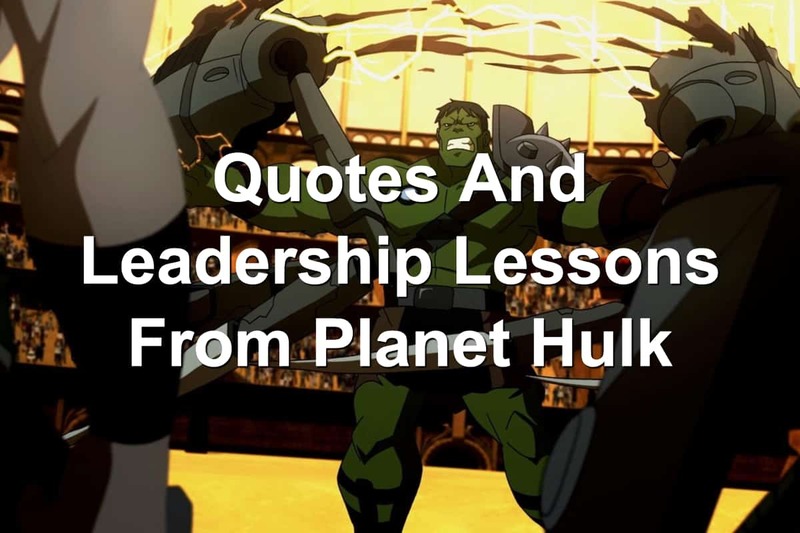 If you haven’t seen the movie, what leadership lessons from Planet Hulk that I shared resonated with you? Let us know in the comment section below.